I came across this event which was called ‘Dinner with Peers’. As I never heard of ‘Peers’ it kinda drew my attention. So what is Peers? Peers is a non-profit organization that supports the sharing economy movement. They believe that by sharing what you already have – like cars, homes, skills and time — everyone benefits in the process. While I was signing up to this event, I still wasn’t sure what I could ‘share’ to be a relevant member. But I was curious to found out and maybe learn from other Peers-members. The dinner was set up in Potluck-style, so everybody had to bring some food or drinks. That sounded fun, although since there where 80 people coming, I wasn’t sure if it would be the most efficient way. But I guess that’s just the ‘Dutch-structured-me’ thinking. As soon as I entered at MOB, which is a super creative co-working space, I found myself surrounded by all kind of interesting people. It was a good mix of interests. There were fashion designers, architects, psychologists, more creatives, bike-guides, translators… a bit of everything. The table with food was soon filled with all kind of goods. Everybody definitely shared their time to create something in the kitchen. I was pleasantly surprised. After a small introduction, some beers, some food, we had a live call with the founders of Peers in San Francisco. 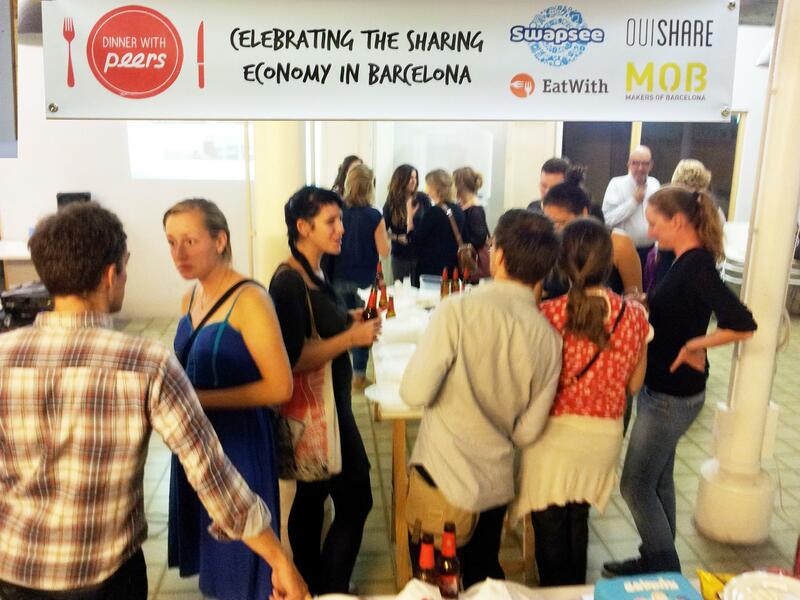 We started to share thoughts on ‘Sharing Economy’. Peers had some early successes already; the state of California legalized ridesharing and currently they are fighting in New York to legalize homesharing. This made some bcn-members curious, since the law is a lot harder to influence in Spain/Barcelona. Peers offered to help with their experience on this. In the end it made me realize you don’t need to have a big plan or idea in order to be able to share. It can start with something small as sharing your ride, or sharing a cab. I think the most important thing is that you start being aware of the fact that you CAN share and participate in any kind of way. Even if you just spread the word, you share. So let’s all try to think a bit more alike. In the end we’ll be able to make money, save money, build stronger communities and reduce waist. After all; sharing is caring. If you want to read more about Peers, be a member and take action; join them at www.peers.org.